The world's first selfie-snapping, asteroid-hunting, public space telescope is $1 million closer to its launch into Earth orbit, having surpassed its initial crowdfunding goal. Planetary Resources' online fundraising campaign soared past the seven-figure mark Wednesday evening (June 19), green-lighting the asteroid-mining company's plans to deploy a publicly accessible space telescope in 2015. "Thank you everyone who pushed it over the $1 million mark!" Peter Diamandis, Planetary Resources' co-founder, wrote on Kickstarter, the website that is hosting the crowdfunding campaign. It took 20 days to raise the $1 million. Pledges can still be made for another 10 days, until 10 p.m. EDT on June 30 (0200 GMT July 1). Planetary Resources intends to mine near-Earth asteroids for resources such as water and precious metals, with the ultimate goal of helping expand humanity's footprint out into the solar system. 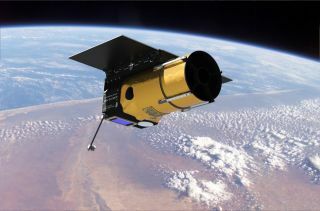 The company has designed its Arkyd-100 space telescope to search for potential target space rocks. "Our primary goal has been to build technology enabling us to prospect and mine asteroids," the company wrote on its website promoting the funding campaign. "We've spent the last year making great leaps in the development of these technologies. These advancements have presented us with the opportunity to engage in another passion of our team: to make space exploration accessible to everyone." Planetary Resources launched the crowdfunding drive on May 29 during an event held at The Museum in Flight in Seattle. For just $25, the company offered to upload a photo of the backer's choice to the Arkyd, display it on a small digital screen mounted on the exterior of the satellite and then capture it in a photo with the Earth's horizon looming in the background. The "Space Selfie" promises to be the first orbital "photo booth," delivering digital images (or prints at higher pledge levels) to the supporters. For pledges beginning at $99, supporters' funds contribute to students' and scientists' research using the Arkyd. For $200, backers can opt to point the telescope at an astronomical target of their choosing. A $5,000 pledge buys the chance to identify a school, university or museum to receive observation time. At the top level of support, $10,000 or more, backers are offered tours of Planetary Resources' facilities, invitations to the Arkyd launch, the opportunity to etch their name on the space telescope and the chance to name one of the asteroids that the Arkyd is expected to discover. Planetary Resources also lists "add-ons" to the pledges, including T-shirts and greeting cards printed with supporters' astronomical or "Space Selfie" images, an Arkyd embroidered mission patch and a half-scale model of the space telescope. Bolstered by media reports, endorsements by "Star Trek" actors and by museum directors, as well as the support of about 70 social-media evangelists who the company calls "Vanguards," Planetary Resources' Kickstarter campaign raised more than $200,000 on its first day. By the second day, the pledges surpassed half a million dollars. It took only four more days to reach $750,000. On Wednesday, the final push to $1 million was helped by a post on The Oatmeal, a popular comic website. "I donated the maximum amount, $10,000, which means I get to... name a freakin' asteroid," wrote Michael Inman, The Oatmeal's founder, in a note to his readers. "They've got 11 days left to meet their goal, and if this project is successfully funded, I'm going to let you guys vote on the name." With $1 million behind them (the project was 101 percent funded within several hours of the goal being reached), Planetary Resources is now looking to its "stretch goals," including adding an additional ground station at $1.3 million, a digital "Beta Selfie" taken of each supporter's self-photo during the space telescope's build up at $1.5 million, and a $1.7 million "mystery goal" that the company says it will reveal when the campaign reaches 15,000 backers. Ultimately, Planetary Resources wants to double its goal. At $2 million, the company will add the ability for its Arkyd space telescope to help in the search for alien planets. "We're not done yet," Chris Lewicki, Planetary Resources' president, said in a video released late Wednesday night. "We have got stretch goals out there, the $2 million alien-hunter goal, where we turn the Arkyd into a planet finder." Lewicki and his team gathered in the Planetary Resources' Seattle office to watch the total pass the $1 million mark, celebrating the milestone with champagne. "It was really a great time," Lewicki said, showing a photo of champagne being poured over his head to explain his "disheveled" appearance. "Thanks to everyone out there again and help us take this momentum through the last 10 days of the campaign." For more information, see planetaryresources.com or the company's Kickstarter campaign. Follow collectSPACE.com on Facebook and on Twitter at @collectSPACE. Copyright 2013 collectSPACE.com. All rights reserved. Story on SPACE.com.